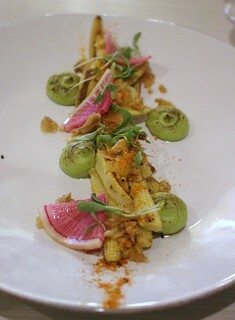 Don't see it as a boring vegetable dish, the tender baby corn contrasts nicely with the crispy chicken skin. 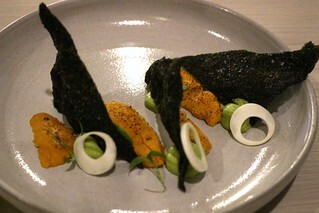 I still prefer my sea urchin fresh and plain, but I enjoyed this fun interpretation with the seaweed chips (aka "doritos) and the added rich mouthfeel of the avocado mousse. It seems like he likes to use avocado mousse this season, doesn't it? After seeing other people's instagrams later on, I regretted not ordering the chicken liver mousse with hazelnut. You guys should order that and let me know! 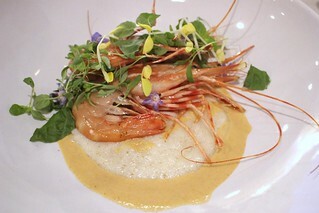 With the cream of wheat, this dish is reminiscent of shrimp and grits. I love spot prawns, and these ones were very sweet and succulent. 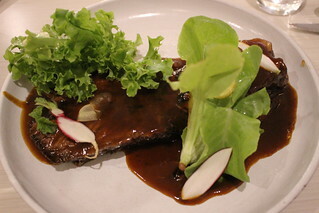 For the brisket, the chef smokes it for a long time like a proper Texas brisket, but dresses it in hoisin and serves it with lettuce, reminiscent of the Korean way of wrapping meat in lettuce. Compared to the other dishes, the brisket's portion is unusually large, making it one of the best value items on the menu! The brisket was very tender, and the sweetness of the sauce was just right. 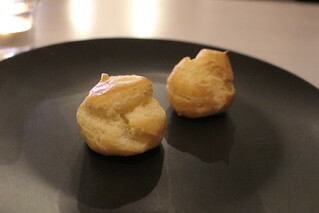 This was my friend's favorite of the night - before desserts that is. The beet's flavor surprisingly stood on its own compared to the sweeter berry sorbet and the chocolate it was served it - but if the thought of a beet dessert scares you, don't be scared. Beet desserts are wonderful! I hadn't ordered this but the kitchen sent it out for me to try and I'm so glad they did. The reimagined peanut butter and jelly goes far above and beyond the original sandwich. 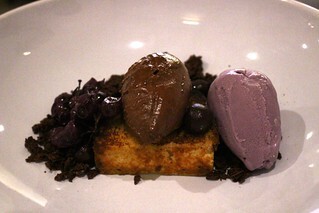 There's the rich and smooth peanut butter ganache combined with the cold grape ice cream. And then there's my favorite part: the pile of roasted grapes mixed in with the crunchy chocolate feuilletine. 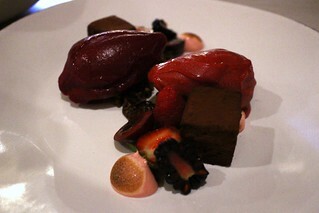 It's a heavier dessert than the beet semifreddo, to be sure, but it is definitely worth a try. 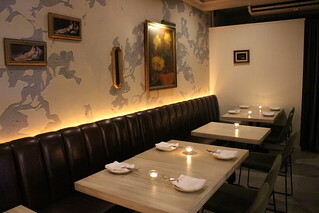 The restaurant's interior makes you forget that you are in a Koreatown strip mall. It's quiet, dim, and subdued. The name "Saint Martha" refers to the patron saint of "cooks and servants", and the restaurant's food is certainly a worthy tribute to the cooks' saint. 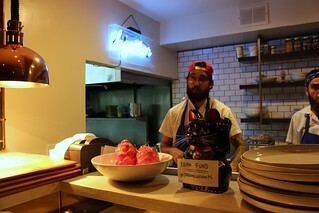 Unlike the demure dining room, Chef Erven keeps his kitchen fun, complete with a "hipster" neon sign and a maneki neko (lucky cat) piggy bank for the staff's "beer fund". 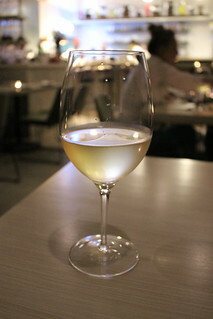 I really enjoyed my visit to Saint Martha, and I think other bloggers will agree with me when I say that this is one of LA's best recent openings. 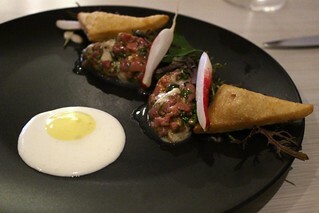 I myself can't wait to return to try more of the menu items - like that chicken liver mousse I keep hearing about.